Returning to a location is always a good thing - you can see how the light behaves at the different times of the day or year and you'll almost always find something different. I return to many places across Edinburgh to try a different angle or technique. A favourite is definitely Stockbridge in Edinburgh where I will return to the market archway or Royal Circus Lane. What I am showing here is a little easier for me though - it's my living room window. I am lucky enough to live in Edinburgh with stunning views of Arthur's Seat, Salisbury Crags, and Calton Hill. Since getting my DSLR, these views have become a favourite to return to on those quiet moments when something catches my eye. This is one of the first I took when I was given a lens by my Dad. It was the clouds that grabbed my attention and how they almost match the shape of the trees. 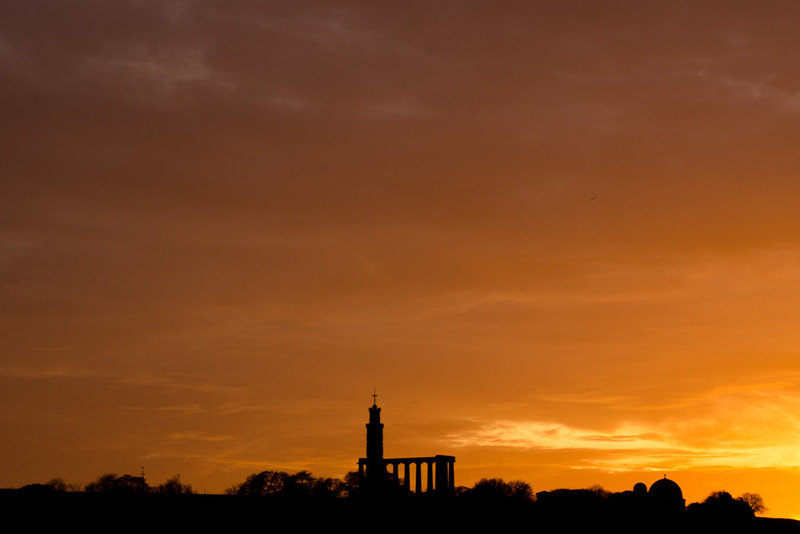 The first silhouette of Calton Hill I took and what I regularly return to. It was taken during a stormy period which broke for a lovely sunset. I had actually spotted a similar scene to this before but my camera was nowhere to hand. Since then I had been watching for the moon to be in a similar position at sunset. It was worth the wait. Sometimes a sunset will amaze you - how can the sky be so different each time the sun sets?That is why I enjoy capturing it, made better by a lovely foreground. From time to time I will focus on Salisbury Crags. It wasn't until I downloaded this photo from my camera that I noticed a lone figure standing on the edge of the crags taking in the same sunset. Believe it or not, but this was taken a few moments after the previous one and shows how quickly a sky can change. At New Year we get an incredible view of the fireworks that are launched from Edinburgh Castle directly behind Calton Hill. This again is a wonderful framing. There is no doubt in my mind that I will continue to shoot this view until the day we no longer live here. It's one of my favourite views of Edinburgh and I'm lucky enough to have it from my living room window. I posted last year about our trip to Belgium to visit the battlefield memorials from World War I and to visit where a relative of mine was remembered. Being Remembrance Sunday I thought I would share them again. I've been a bit quiet recently - on here, Twitter to a degree, and definitely on Flickr - but there have been things happening in the background that I thought I would let you all in on. Firstly, the group exhibition in May - "Two Cities" - had a prize giving night where a panel decided which photos were the best of the bunch for a handful of categories. The prizes were divided into "winner" and two "commended" slots for each category and then there was a "Viewers Choice" which was voted for through the week by visitors. If you missed the theme of the show then it was to display two photographs of Edinburgh with contrasting views of the city. I was delighted to win two "commended" prizes on the night - one for best photograph with "The National Monument" and one for best photographs that matched the theme. For me, these were two main categories - they showed your ability as a photographer and that you can curate your work adequately enough to a theme. Shortly after the exhibition in May I heard that The Edinburgh Sketcher, Mark Kirkham, was displaying his work at Tidalfire in Edinburgh. Tidalfire are not a gallery but a training company that specialise in Adobe products, design and coding languages. Inside their shop on St. Mary's Street (just off the Royal Mile/Canongate) they have blank walls and an empty window so they created "WoO" - the Window of Opportunity. Artists can use the space to display their work for two weeks using the walls inside and the window display. It's an opportunity I want to be part of so I will be displaying my photography there from the 22nd October until the 5th November 2012. I'll post more details as I have them. Friends and family have been very supportive over the last year or so by promoting my work, but I also love the honesty when you need to hear it most. "Iain, you need to get some new photographs up" said Matt, my brother-in-law, and he is absolutely right. I've been shooting quite a lot over the summer, experimenting with different techniques and formats so I have a lot of black and white film still to be processed which I hope to have done soon. The summer months have had me on holiday quite a few times with my wife including visits to Bath, The Highlands, and Venice where I have shot a lot of colour film for a change. With all that I'll have plenty of photos to be sharing with you all soon. Last week I submitted two pieces of work to be shown at the YMCA in Edinburgh as part of an exhibition called Two Cities. It's the first time I have put my work on show outside of the internet and it felt like the perfect exhibition to take part in to get me started. The idea was a simple one: one piece being a classic view of Edinburgh and one that is more hidden. I looked at my favourite shots of Edinburgh and knew what Classic Edinburgh" shot I was going to use straight away - I took a pinhole of the National Monument back in January and I was very proud of it. The "Hidden Edinburgh" was a different story, I pondered this one for a while constantly aware that I would need to have it printed soon. What angle do you go for? Urban decay? It's been done so much and in better ways that I have. In the end I stayed with what I enjoy shooting most in the City and that is the Georgian New Town and that includes a small lane that runs behind the grand houses of Royal Circus - Royal Circus Lane. I took this photo in February 2011 (the same day I took the photo of "BERNIE the Bingo Machine") and I was very pleased with it. The exhibition runs from Saturday 9th June 2012 until Sunday 17th June 2012 and I'll be heading along for the first time tomorrow night for a look at what the others have put together, it would be good to see you there.